*PROMISE* is my first collection of poems illustrated in colour with my paintings, which I have designed and published myself. 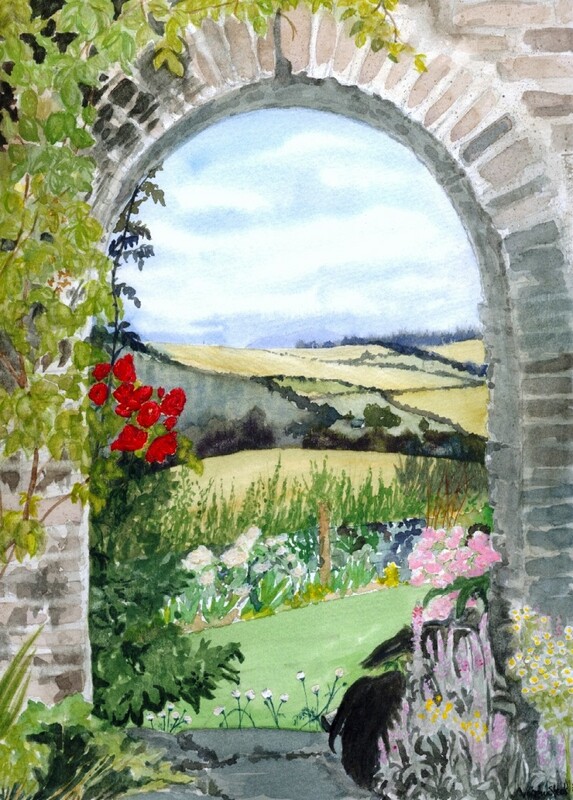 The cover illustration features my painting 'Rose Archway'. "I like the mixture in this collection, the haiku-like 'Letter' and 'Elephants' contrasting with the longer narrative poems like 'Bread of Life' and 'False Start'. The first encapsulate moments, events, while the story-telling quality of the second is always captivating, making the reader want to know what happens next. But what stands out for me is the use of nature as symbolism for the spiritual. This is done in such a natural way, never contrived, it has to be part of her outlook on life." Sue Tordoff, Writer, Former Editor of Write-Away. "You have done a superb job on the booklet. Well done. Keep up the good work." "Vivien Steels is an artist and poet who has produced a delightful booklet, *PROMISE*. Her delicately beautiful illustrations complement the poems. 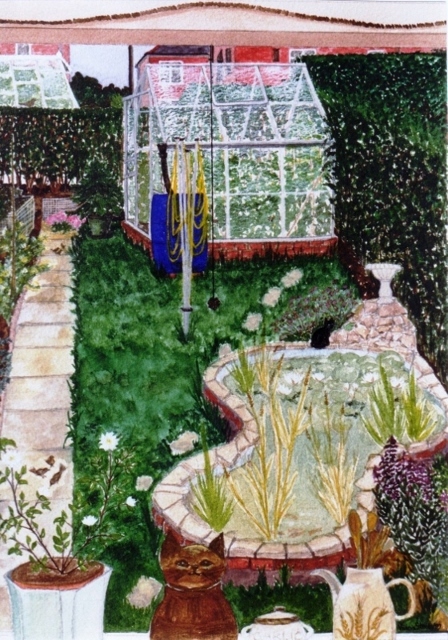 There is exquisite detail in such illustrations as 'Summer's Garden'. There are poems about having ME, the Gulag Camps and lyrical poetry, such as the loving descriptions in 'Sea Otter'. Many poems pack an unexpected punch." "(This collection) is very impressive. Her descriptive powers are second to none. The poems are better read in one big attention span as they reinforce each other. I loved them - nothing forced. She knows when she has said enough and that is often a fine line to draw." "I love it, Vivien Steels' collection is wonderful! I will keep going back to it. I think her paintings set the whole thing off beautifully and the front cover is just stunning." "From the start this collection showcases Vivien's ability to draw vivid and sustainable mental images. These images remain long after the book's white covers have been closed. *PROMISE* is a great title to open the collection; it has been chosen wisely and correctly as this promise is never broken. The collection gains momentum rather quickly, with a mixture of short and long narratives. These are interspersed with carefully chosen plates, which complement rather than distract. The poetic content is mainly reflections and stories written from a personal angle, but not secular. Vivien's work is always accessible. I have to choose my favourites so 'What is Needed', 'False Start' and 'Ivory' get my vote. The collection ends quite poignantly with 'Dove'. Peace, tranquility, the idea of collecting a branch to show that all is well. Vivien, let your own dove fly away to bring back another collection. One is just not enough." Vivien Steels is a good emerging poet whose work gets stronger as time goes by. I look forward to reading a complete collection one day." "*PROMISE* was most enjoyable; lovely use of language and artwork." "*PROMISE* - Pamphlet collection by Nottingham poet and artist, Vivien Steels, illustrated with her own colour paintings. Look out for her work exhibited locally." 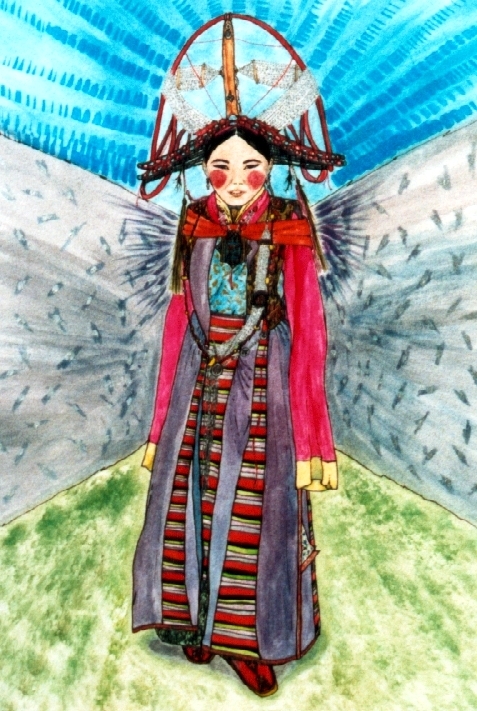 *MANDALA* is my second collection of poems illustrated with my paintings and the cover illustration features my painting 'Tibetan Festival Costume at Gondalen Monastery'. "I have really enjoyed reading your poems, Vivien. I recognised one or two that you must have read at the Writers' Group, but I find it much better to be able to read them myself. That way I can absorb the wonderful imagery you conjure up and savour the words. The poem 'Mandala' intrigues me. My dictionary gives both a religious and a dream connection to the word. But your poem seems to go beyond this and also there is the picture of the 'Tibetan Festival Costume'. I remember you reading 'Breaking Up' at the Writers' Group. 'The milk's been cancelled forever', struck a chord with me then and again now. I feel you could almost have a one line poem in that, not only for breaking up, but for any time you lose someone. From the same poem 'A slab of heartache falls across the doorway to happiness' is a wonderful description of the heaviness you feel when you lose someone. 'Give me a Pen' - I love every verse. 'The Lake of Buttermere' - Like the repetition of 'It's misty over the mountains'. And 'A line of trees is caught walking head-down along a rounded hill top.' How do you think of such evocative word pictures? 'Psychedelic' - So clever the way you use the colours to paint the sort of images we all long for. You put so much thought into the presentation of your work. 'Frost' - Three lines of magic. 'Wrap' - Love it! 'Pull on cashmere shawls of words, snuggle into sweaters of similes' and all the other blending of woolly metaphors, including the way you have 'wrapped' it around your picture. The whole collection is very professionally presented and you have such a wide variety of styles and subjects that there is something for everyone." "I like virtually all your poems, so it's difficult to pick ones out. You've got a real gift for describing the natural world - I especially liked the way that what we throw away is a banquet for the fox in 'Suburban Fox'. I really like the delicate but also powerful way you end some of the poems - 'Sassie Midwinter' and 'Bread of Life' especially. That's a gift of yours too. I think 'Give Me a Pen' is absolutely beautiful. You've had the courage to be that simple and direct. It reminds me of Peter Russell (1921-2003), one of our most underrated poets and a great influence of mine. 'Beheld' has the same quality - and 'When I Was Young'. Another ending I think is terrific is 'Today is a bad day' from 'So You Have M.E.'" "It was lovely to receive your two volumes of poetry - deep, eloquent verse accompanied by charming paintings and sketches. I loved your tender portrait of Miffy (a most pampered cat) in 'Cleonine', both in verse and pictures. How much of your writing is biographical? It is very beautiful." "I DID enjoy *MANDALA*; you have a style all of your own. You live in a different world to me, but your poems keep giving me a special glimpse of it." "Great use of words and subject matter. Lovely turn of phrase, alliteration and even a poem that rhymes! I loved 'Frost' - perfect & beautiful." 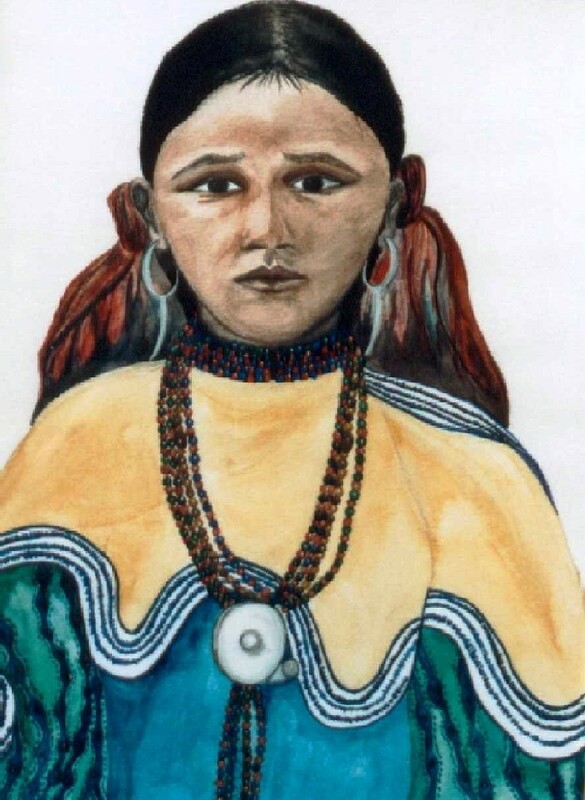 *SECRETS* is my third collection of published poems illustrated with my paintings and the cover illustration in this collection features my painting 'Apache Girl in Deerskin Cape'. Vivien Steels is a UK writer and illustrator based in Nottingham, England. She is perhaps best known for her poetry and art in watercolour, acrylics, pen and ink. Her work has been published extensively in both print and electronic form. She has exhibited her art in local shows, and acted as Poetry Editor of the web-based poetry magazine WAH during 2005/06. *SECRETS* is Vivien Steels' third collection of twenty-three fascinating poems, and seventeen artful illustrations, compiled on nineteen pages within a glossy cover. The words are nimble, switching deftly from various forms such as haiku and free verse, to cover a wide range of topics. There are poems that celebrate nature, such as 'Green Summer Gold', and 'Spring Equinox'; those that explore loss in various forms, such as the opening poem, 'Secrets', and 'Early Frost'; fantasy works, such as 'Witch Writer'; and then there is the skilful handling of the unfortunate darker experiences of life in the poems 'Illness', and 'Against Humanity'. The illustrations bear Ms. Steels' signature attention to detail and lightness, each one enhancing the accompanying poem and worthy of its own attention. Indeed, the illustrations are a real treat and Ms Steels' love of nature is apparent in each one. The presentation of the book is very pleasant, with images aesthetically scattered among image-rich poems. Each poem, each illustration deserves to be savoured individually and as part of a whole project. Anyone who loves art, who loves poetry, who loves nature, who loves beauty, would appreciate having a copy of Vivien Steels' *SECRETS* on the bookshelf, as well as extra copies for gifts. In this day and age of business and haste, *Secrets* is just the trick to rejuvenate. *HOME FROM HOME* is my fourth collection of poems illustrated in colour with my paintings, designed and published by myself. 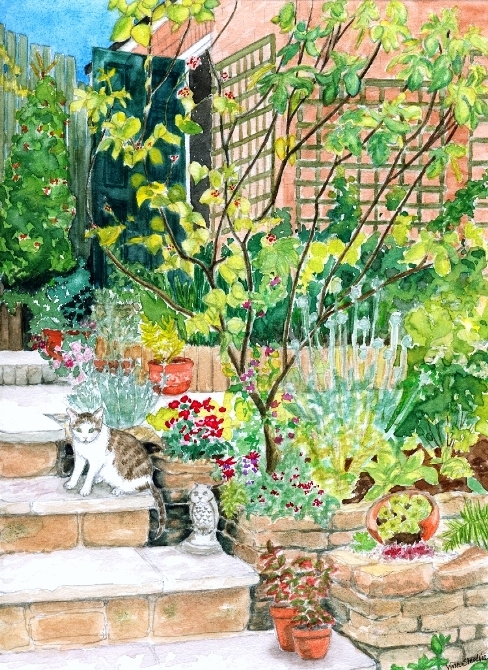 The cover illustration features my painting 'Summer's Garden'. "*HOME FROM HOME* by Vivien Steels is her best yet collection of enchanting poems and magical illustrations. Each poem feeds our soul waters with rich and deep feeling and reflection. Each is a meditation in its own right. I loved them all, but To Say Goodbye is my favourite because of Vivien's courage to revisit her own pain of losing her father. Her powerful, life-filled words galloped through me like a herd of wild horses, bringing tears as I sat next to my own dying father's bed, holding his cold hand and wondering when his roller-coaster ride would finally end. Her final lines in this wonderful poem: 'I'm caught between pain and healing, cutting myself up because I never got to say goodbye.' Vivien, your poem is a beautiful way to say 'goodbye' to your father, and helps us all to know the meaning of love in life." Don Iannone, Poet and Businessman, Cleveland, Ohio. Visit Don's website Poetic Alchemist. "I enjoyed *HOME FROM HOME* very much. Your usual high standard! I think Don't is very emotive and would strike a chord with anyone who has been in an abusive relationship whether physical or mental battering. You capture the feelings perfectly of someone trying to fight back. I particularly liked two of your shortest poems Drop and Gone. You have painted an amazing picture with both of them in three short lines. Wonderful!" "Vivien Steels' new book, perfect use of words, sort of Japanese..."
*WINTER WHITE* is my fifth collection of poems illustrated in colour with my paintings and photographs designed and published by myself. 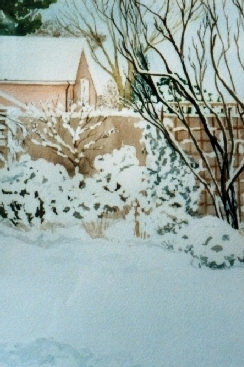 The cover illustration features a detail of my painting 'Our Garden - Winter'. a new book of poetry and illustrations, to warm the spirit. In her new book, *WINTER WHITE*, Vivien demonstrates her amazing dual talents with finesse in both drawings and words. In her poem, 'White', we are offered a magical array of sheep, foam, milky mists and an opal moon, that stagger the senses with a mystical softness. Just as we are losing ourselves in the dreamy atmosphere, we are swiftly brought back to reality in a heartbreaking poem, 'Bread of Life', in which a tiny baby is abandoned in the snow. All ends well, but not before we are presented with an array of the finest images and the photographic warmth of her words. 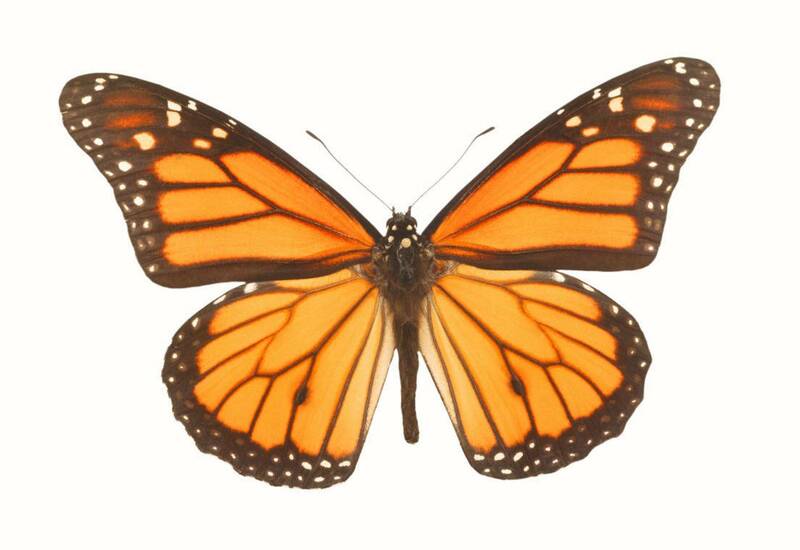 Vivien's art is very strong and visual, but retains a delicate beauty that is a pleasure to view. In her work it is difficult to know which she envisions first, for one compliments the other perfectly. Her beautiful words capture the reader's inner eye as often as the illustrations. Both reveal a woman who is a natural, undeniably talented, weaver in both genres. The poem 'Lone Wolf' is a beautiful tribute to an animal that is often hunted and hated. finding only the dead end of a bullet. laden boughs of pine. Majestic and proud, it also holds an expression of innocence - after all - it has no plan of arousing man's anger, and has no idea when it does. Vivien's sensitivity with words and visuals is striking. She conveys a unique understanding of the natural world, the ordinary, and the spiritual. My personal favorite is the poem, 'Germaine'. The poem captures the life of Germaine Cousin, later known as St Germaine of Pibrac (1579 - 1601). Germaine was an abused child who endured tremendous hardships, yet maintained a deep love of God, and an optimistic heart. She was inscribed in the lists of saints by Pope Pius IX, in 1867. The poem fits in well with this book that honors the downtrodden and the innocent. Vivien reaches for the finest in the human heart and nudges it toward brotherhood. Her work has keen insight and champions the underdog. The prospective reader is dazzled in *WINTER WHITE*, by the strength of her sheer perspectives, both psychological and earthy. This book offers the opportunity to experience a cold and barren landscape that is completely unthawed by the dignity and beauty of Vivien's all seeing eyes. *INTO THE PAST* is my sixth collection of poems and prose based on selected memoirs illustrated in colour, sepia and black and white with some of my line drawings, photographs and graphics, which highlight certain memories from different times in my life. The cover illustration features a detail from a photograph 'Me and Miss Sammy'. It was taken on holiday at The Auckland Guest House in Bexhill-on-Sea in 1962 and you can just see my lovely father in the background to the left. *INTO THE PAST* was inspired by memories recorded at two Memoir Workshops held in Nottinghamshire by local tutor, Jenny Spencer in January 2012. I was encouraged to plunge my hands into the lucky dip of memories and, as Agatha Christie once said, 'come up with a handful of assorted memories'. "Your book *INTO THE PAST* is absolutely delightful. I loved reading about Mrs Makings - I can see you scrummaging about in her shopping bag and finding her false teeth wrapped in a checked handkerchief. So pleased that you have incorporated the pieces you started at the Memoir Workshop I ran. It has made me very happy to see the finished product. Your book is so full of warmth, wit and love. Anyone reading this book will have an idea of who you are, which is precisely what a memoir should be. But it is more than this - it is magical. Thank you for sharing your memories with me." *BEES, SEAS, BIRDS AND TREES* is my seventh collection of poems illustrated in colour designed and published by myself with some of my paintings, photographs and graphics. It collates many of my published, nature-inspired poems and brings them into one volume. The cover illustration features my painting 'From Our Kitchen Window' - a painting of the view from our kitchen at our last house. You can see the whole cover on my Blog at my Heart-Work website. I have just read your new book of poems 'Bees, Seas, Birds and Trees'. What a lovely collection of poems they are. The poems are a pleasure to read. Your words show a heartfelt, philosophical understanding of all aspects of nature and human emotion. Reading your poem 'Honey, about your pet rabbit, brought a tear to my eye. What a lovely tribute to him and a recognisable mixture of emotions for all of us who have lost a beloved pet. When I started to read your poem 'Everlasting' it instantly reminded me of my mother. Sweet peas were her favourite flower and whenever they are seen or mentioned I see her, so it was funny to realise as I read your poem that you too are reminded of your mother. You not only produce such lovely words, but are able to illustrate them with such beautiful artwork. * If you would like a copy of *Promise*, *Mandala*, *Secrets*, *Home from Home*, *Winter White*, *Into the Past*, or *Bees, Seas, Birds and Trees*, please e-mail me, Vivien Steels, with your address for an Order Form.